Devon Partnership Trust, who run mental health services across most of Devon, planned to implement a “choose and book” telephone booking system for mental health assessment. 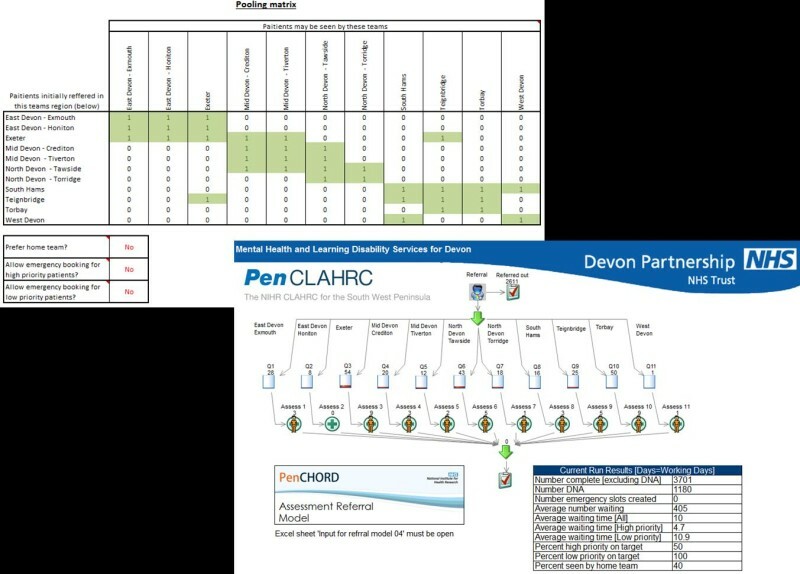 The Peninsula Collaboration for Health Operational Research and Development (PenCHORD) a research team based in the Medical School at Exeter University were asked to advise on how many appointment slots were needed in each team to meet waiting time targets. Simulation was used to assess the choose and book system and to demonstrate the principle of queue sharing where waiting times may be reduced by allowing teams to share work when appropriate. The result is that the trust has significantly reduced waiting times for mental health assessment. A simulation model was developed in Simul8. Patients arrive at random and in proportion to the demand in each team region. Patients may be seen by any team as identified in a “pooling matrix” – this may be used to limit patients being seen only by their local team or by being seen by close neighbouring teams (or a hypothetical model may be tested when any patient may be seen by any team – to understand the maximum beneficial effect of queue sharing). The simulation model contains a virtual diary of appointment slots available for each team; patients are then allocated to these diary slots. Scenarios were tested with varying capacity within each team and also with varying strategies of sharing of work. The example below shows one example of queue-sharing between teams and demonstrates how most of the potential benefits of queue sharing can be obtained with local sharing between neighbouring teams. The choose and book system has been implemented with local queue sharing – appointment slots within the target time and within the local area are available to be booked by the patient. 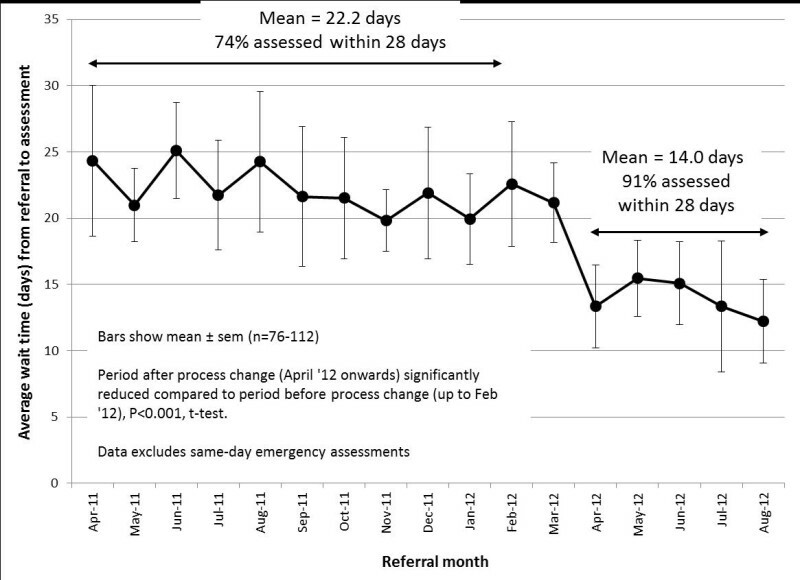 The chart below shows a significant reduction in waiting times achieved during the roll-out of the first area (with sharing between two teams as necessary). The system is now being rolled out across Devon.